What are his attack matrix and saves tables? What kind of armor does he wear? I think I’m missing a page. The Scout class for Basic Fantasy 2E is a different take on the ranger. I don’t have a link, but I like that one, too. There needs to be a thief analogue for outside the dungeon IMO, and this is a good version. 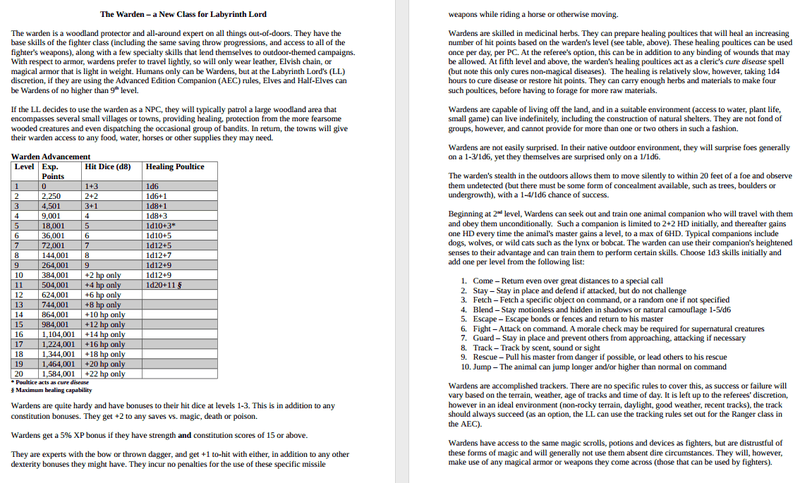 The warden uses the same saves and attack matrix as fighters, so you can use the tables found in the Labyrinth Lord rules. Allowed armor is leather, Elvish chain or magical – basically any lightweight armor, so there is some room for the DM to house-rule here. You should have two pages (three if you count the license page). My intent was not to create an outdoor thief type of class, but I think you are right that the warden works as that with the light armor and stealth rules. I’ve been considering adding a rule allowing the warden to detect, set or disarm snares and traps, this would also fit with the thief aspect. Thanks for the comments!